At Caplin we don’t need to support the ancient Internet Explorer 6 & 7 browsers, which makes development a lot easier, but IE8 still has some bugs to make life difficult. On a recent project we found an annoying one affecting inline-block elements, where IE8 refuses to repaint the layout and update the size of the element when it’s changed. One of the motivations for writing this post was that when I was trying to figure out why we were seeing the problem, I read a lot of posts from people complaining that elements weren’t resizing properly, but nobody seemed to know why. There was also some misinformation out there; some people thought that IE8 didn’t support inline-block. While this was certainly true of IE6/7, I’ve found that IE8 generally supports it quite well; you just have to know how to handle these odd bugs. The problem is that if the size of any element more than one level deep inside an inline-block element changes size IE8 will change the size of the inline-block element to contain the resized element, but it wont affect any of the elements around it! This is better shown with a few examples (of course, you should open the JSFiddle links below in IE8 to see the bug in action). In this situation it works fine, as the child element we’re expanding is the direct child of the inline-block element. But what if we move the expanding element further down the tree? Now we start to see a problem. IE8 adjusts the size of the square correctly, but it doesn’t push the squares in the row below out of the way like before. 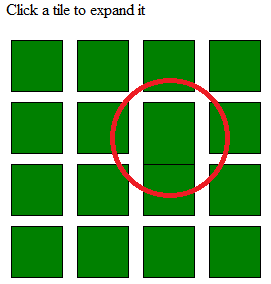 For some reason it doesn’t process that the size of the square element has changed and that it needs to repaint. If you resize the window while it’s in this broken state, IE8 will realise that something’s changed and will repaint everything correctly. This seems to be a genuine IE8 rendering bug so I don’t think there’s a proper “fix”, but there are some things we can do to work around it. The simplest thing would be to avoid using inline-block in the first place, or to remove the extra layers of elements between the inline-block and your expanding element (like the first example on the page), but these aren’t always possible. We came up with our solution when we noticed that this bug only occurs when you’re dealing with block level elements; if you change the extra divs we added in the second example to spans the issue disappears! If you don’t want to use spans you can achieve the same result by setting the divs to use display: inline or inline-block. Only the elements on the way down the chain to the element changing size need to be changed – the actual expandable element is fine as a block. Dude I spent hours & hours on such an issue. Thanks for the post. Help me solve this annoying bug. Similar to Randy’s I solved it by just setting and removing a css property on body. I using height, but it seems that any property will do the trick.